Jane Griswold Radocchia: The Bible and Vitruvius knew about Practical Geometry; Plato did too. The Bible and Vitruvius knew about Practical Geometry; Plato did too. The lecture will be copiously illustrated, but not hands-on. Unlike the IPTN Workshops no one will learn to use a compass. Preparing a talk always requires that I do more research, more than I can share in one talk. So here is some of what I will paraphrase, starting with what was written at least 2600 years ago. Isaiah 44: The carpenter stretches out his rule: he marks it out with a line; he fits it with planes, and he marks it out with the compass. 1: Theory ... is the ability to demonstrate and explain ... the principals of proportion. ...he must have knowledge of drawing s that he can readily make sketches to show the appearance of the work which he proposes. Geometry, also, is of much assistance in architecture, and in particular it teaches us the use of the rule and compasses, by which especially we acquire readiness for making plans for buildings in their grounds, and rightly apply the square, the level and the plummet. .. It is true that it is by arithmetic that the total of buildings is calculated and measurements are computed, but difficult questions involving symmetry are solved by means of geometrical theories and methods. 1: Architecture depends on Order, Arrangement, Eurythmy, Symmetry, Propriety, and Economy. 2: Order gives due measure to the members of a work considered separately, and symmetrical agreement to the proportions of the whole... selection of the modules from the members of the work itself, and starting from these individual parts of members, constructing the whole work to correspond. 3. Eurythmy is beauty and fitness in the adjustments of the members. This is found when the members of a work are at a height suited to their breadth, of a breadth suited to their length, and in a word that they all correspond symmetrically. 4. Symmetry is a proper agreement between the members of the work itself, and relationship between the different parts and the whole general scheme, in accordance to a certain part selected as a standard. Vitruvius then mentions how in the human body there is a kind of symmetrical harmony - which becomes in the Renaissance the Vitruvian Man. Buildings must be ... built with due reference to durability, convenience and beauty. Beauty is when the appearance of the work is pleasing and in good taste, and when its members are in due proportion according to correct principles of geometry. Vitruvius praises the Greek writers, specifically Aristotle, Democritus, Plato and Pythagoras. He specifically discusses Plato and Pythagoras. 3. ... Of their many discoveries that have been useful for the development of humans life, I will site a few examples. 4. First of all, among the many very useful theorems of Plato, I will cite one as demonstrated by him. A-B-C-D is a square. A-C is its diagonal. 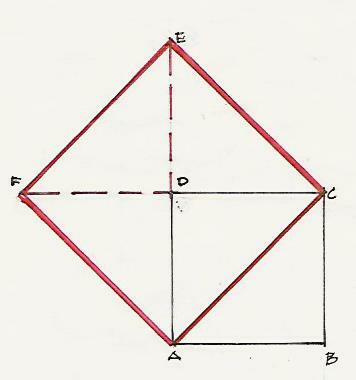 The triangle A-B-C is the same size as A-C-D. 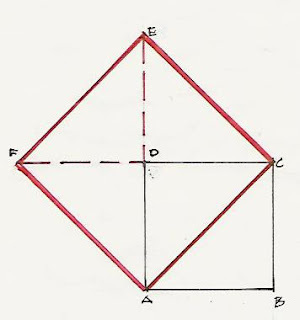 Using A-C as the side of the new square , see that A-C-E-F is made up of 4 triangles, each the size of the original 2 in A-B-C-D.
Look at that! A-C-E- F is twice as big! 7. ...When Pythagoras discovered this fact, he had no doubt that the Muses had guided him in the discovery, and it is said that he very gratefully offered sacrifice to them. Book IX goes on to discuss the zodiac, planets, astrology, phases of the moon and sundials. I have not yet read Plato or Pythagoras on geometry. Next post will be a brief review of the use of geometry in Medieval Europe.